In my earlier blog I have implemented drone which will attack player from distance. You can read the tutorial here. I will use the same asset from Popup Asylum. It’s free and it’s really great! 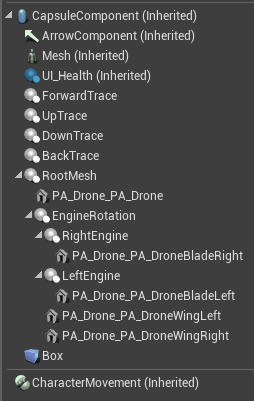 Import PA_Drone.fbx as Static Mesh. 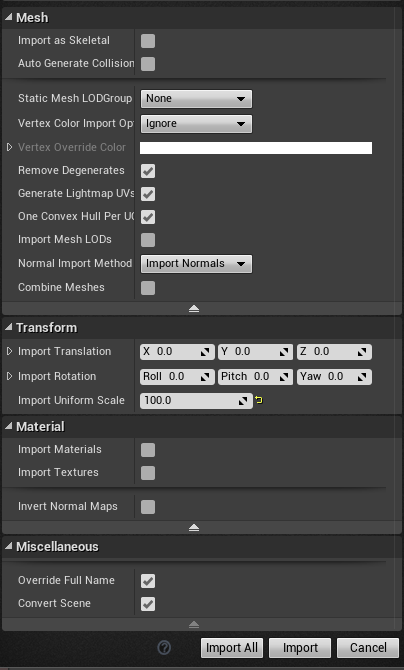 Scale should be set to 100 and remember to deselect combine meshes. You should get couple of meshes. GetDistanceToPlayer – pure function, one float output. We will be using this function a lot in the future so it’s good to have it in BaseEnemy. This will be used for deciding where Drone should go. 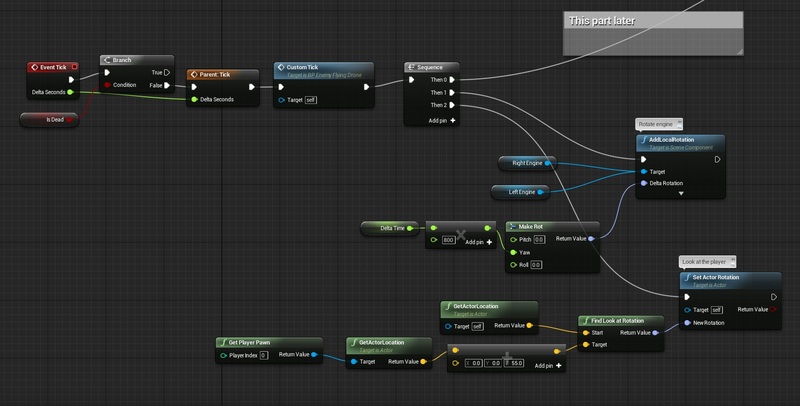 Now create new blueprint based on BP_BaseEnemy named BP_Enemy_FlyingDrone and open it. I want to have rotating engines and wings, so there is couple of things need to be done in components. I will go step by step here. Collision Presets: should ignore Pawn. Here you can see all components. Add new custom event named Explode. 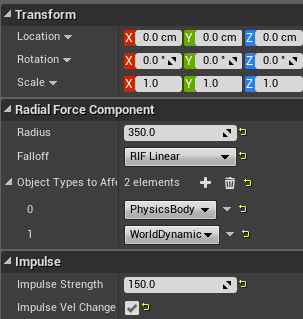 This will enable physics on Drone static meshes and do small explosion effect. Before moving forward create new User Widget named DroneAttack. It should have one Image filling whole screen. 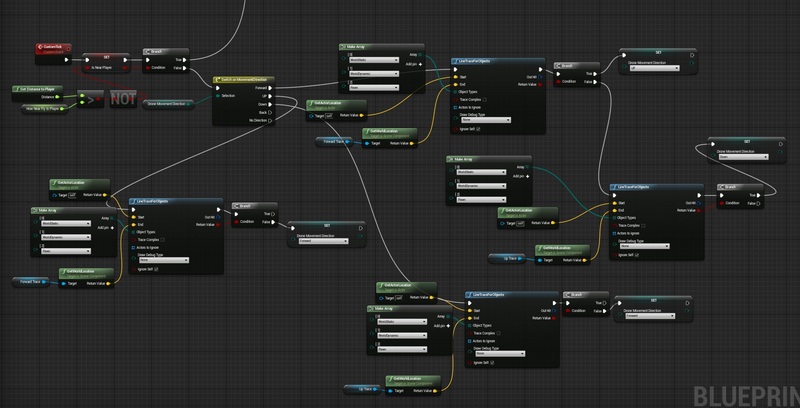 And animation with changing the Alpha from 1 to 0 during one second. On Construct play this animation. This will be used as “flash” the player when drone hit him. Go back to Drone Blueprint and add new custom event ExplodeOnPlayer. This will create the widget and add damage to itself so Drone will die as well. 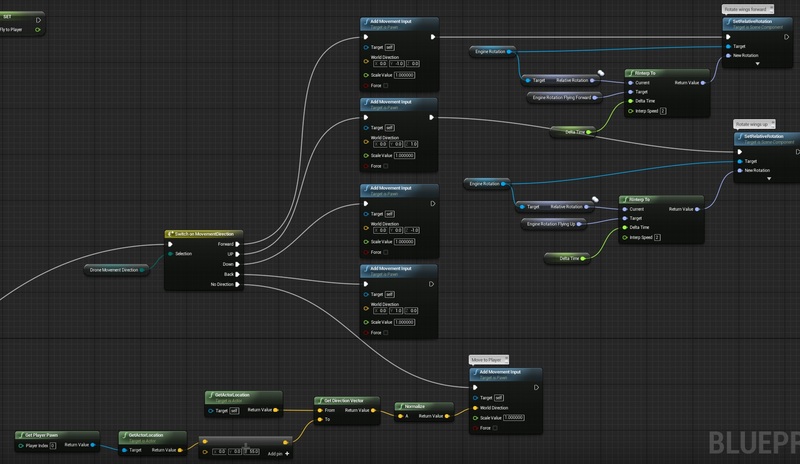 This is functionality when Drone is far away from player. He is performing checks if something is blocking his movement. Changing DroneMovementDirection. For now nothing will happen because we aren’t driving movement from DroneMovementDirection. Drone is near player and he will check if something is behind him. This won’t happen but maybe you would like to stop the Drone and attack from distance. Thanks to this drone will move up to avoid bumping with other enemies. Now create Event Tick and here will be our movement implementation depending on DroneMovementDirection. Tick is big as well so here’s the first part responsible for rotating the engines and look at player. Then 0 is responsible for movement. Direction is used to drive MovementInput. There is one issue here – forward for drone is hardcoded as -Y. My levels will be created this way but your’s could have forward vector as X. If your drone is not moving forward – for example is moving right – this is the place to fix this out. The last empty event is OnComponentBeginOverlap (Box) this is the place when drone hits player. 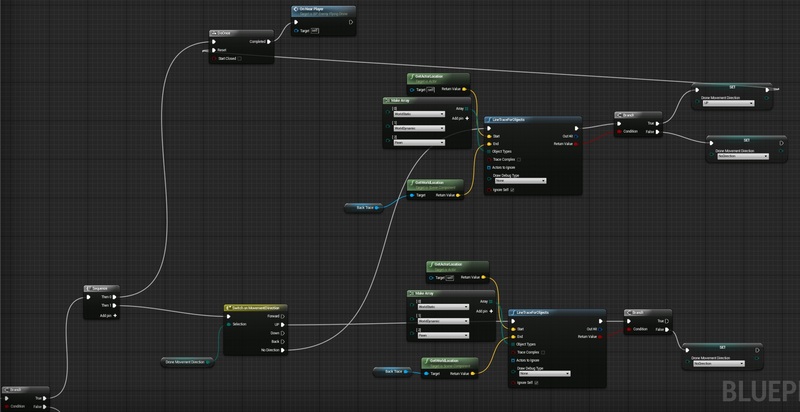 Good Info for the UE4 users. 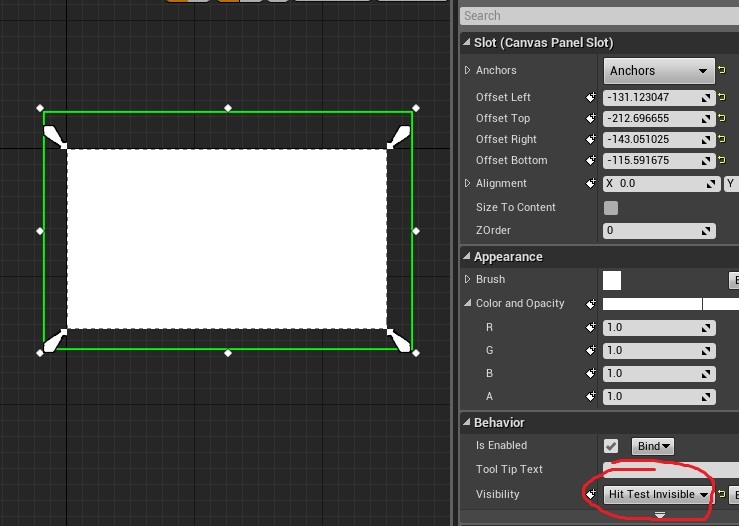 Another note if you’re using your own models and scene files – after correctly setting all your axes for the components, don’t forget to add collision to each of your drone meshes. Otherwise when you blow up the drone it’ll stay in what looks like one piece and fall through the floor.